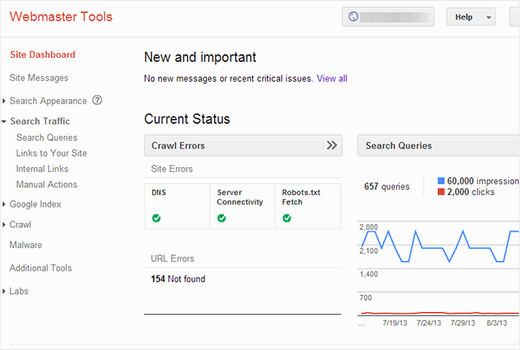 One important step in optimizing your site for search engines is adding your WordPress site to Google Webmaster Tools. Many of our readers ask us for SEO Tips and how to increase organic search traffic on their websites. Using Google webmaster tools along with other tips that we have provided can be a huge help. In this article, we will show you how to add your WordPress site to Google Webmaster Tools. Google’s Webmaster tools is a set of tools offered by Google to give publishers a look at how their website is seen by the search engine. It provides reports and data that can help you understand how different pages on your website are appearing in search results. It shows you the search queries where a page from your website appears in the results and how often it is clicked. This data can help you improve your older articles, write new content, and formulate a content strategy for your website. Google webmaster tools also allows you to submit XML sitemap of your website, exclude URLs, and help Google display the most important content of your website. It also notifies you if there is a problem with your site which is stopping Google from crawling and indexing your pages. Go to Google Webmaster tools website and sign in with a Google account. After signing in, add your website’s URL and hit the add new site button. On the next screen, you will be asked to verify the ownership of the website you are adding. You can either upload an HTML file to your website’s root directory using FTP or click on Alternate method to obtain a meta tag which you can then add to your WordPress site. Now go to Settings » Insert Headers and Footers and paste the meta tag line into the header field. Save your changes and go back to Google Webmaster tools website and click on Verify site button. Alternately if you are using WordPress SEO plugin, then you can copy the verification key in content part of the meta tag and paste it in WordPress SEO plugin. Click on SEO in your WordPress admin sidebar and then scroll down to webmaster tools section to paste the unique key in the Google Webmaster Tools field. Save your changes and go back to Google Webmaster tools website to verify your website. Once you have verified your website, the next thing you would want to do is to add your XML sitemap. Don’t have a sitemap or not sure what is a sitemap? Check out our guide on how to create XML sitemaps in WordPress. After you have finished adding your sitemap, it may take a while for Google to display your site data. 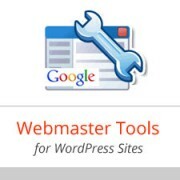 That’s all you need to do to add your WordPress site to Google webmaster tools. Once your data starts coming in, you can use it to your advantage. We hope that you found this article helpful. For more WordPress and SEO tips, you can tweet to us @WPBeginner or join WPBeginner on Facebook. For questions and feedback about this article please leave a comment below. Hi! I was just wondering if you delete the plugin again after having verified the website? Informative article. It is really important to submit your site on google webmaster tools. Thanks you for sharing with us. Spent so much time trying to get the right solution and your easy to watch video showed me in minutes! Spent an hour on other sites trying to figure this out with no luck. This worked first time. Thank you! If you are using Google Search Console (webmaster tools) then you can submit your sitemap directly. Your sitemap is not shown in the search results. Instead it is used to prioritize how search engines crawl and prioritize your content. I was using search console when i was in blogger and now i have shifted to wordprss so i need to delete my blogger search console and make a new one for my wireless site.? I am trying to add my property in Google Search Console . i am doing step by step , i add HTML code in Insert and footer plugin but when i verify it , msg returns we could not find the meta tag . Use alternate method to download the google site verfication html file add the respective file on your server using your cpanel or FTP. Once you upload the file correctly on your server, Then verify your ownership on google webmaster tools. Very helpful post. I appreciate your effort. Please how do I see my own meta tag line? Extremely helpful video that goes straight to the point. I love it when a process I’m trying to implement works out perfectly on the first try. What if I am hosting my site with WordPress.com and don’t have access to plugins? Is there another way to get the code on my site? Thank you so much! That was so clear and helpful. I’m going to do it right now. This was brilliant and very helpful, I always forget how to do this and come back to the site time and again! THANK YOU!!! I have been messing around for hours with this. This video got me verified in minuets. THANK YOU!! You guys are great, and VERY helpful. Thank you! It’s probably worth adding to the article that WMT allows you to verify your site through Google Analytics code as well now, which is much easier than the methods listed above for verification. Or you can use SEO by Yoast which generates your sitemaps for you and then just add them to GWT that way. Just a thought. I’m having a problem verifying with Google that I own my website (and I do, and have since 2012). When I log into my GoDaddy account INSIDE the Google verification page, it rejects my password, yet, at that exact same time, I’m logged into GoDaddy with no problem. Oh, and the instructions inside the Google verification are outdated. For starters, there’s no LAUNCH button in GoDaddy any more. Not being a computer guru, I’m pretty much stymied and don’t know what to do now. If you register domain in GoDaddy then it’s easier, Webmaster tool is integrated with Godaddy then when you click veryfy, it will ask you to login to your Godaddy account and everything is automatically processed. Those are so amazing. Thank you for publishing. Please checkout our guide on the difference between WordPress.com vs Self Hosted WordPress.org. Maria, first thing you should note down is that your website’s URL is the one you see in WordPress Admin area under Settings >> General. So whenever you are submitting your website anywhere use the URL in your WordPress settings. Also note that www and non-www URLs are not the same. WWW is actually a subdomain. Eventhough search engines are smart enough to understand that example.com and http://www.example.com could mean the same. However, due to the technicalities they need to differentiate between the two and take them as two different locations. We would recommend you to start over. Delete your site from Google webmaster tools and then add it again. Hope this helps. that I had to put http:// such as http://www.example.com/. I didn’t it. Google only recognizes the first I put. Can it be a problem? Thanks so much. This was tremendous help. Thank you so much! Your tutorial was the first of many that actually gave me the plug-in to activate in order to enter in the header information. Do you know how long it takes to be searchable on google, once the site is verified? Thank you again! Very helpful. However, the meta-tag information was under “alternate methods” when I did it. I pasted the tag under “recommended” and wondered why it wasn’t working. Thank you so so much. I found it extremely helpful. For the life of me I could not figure out where to upload that link until I saw that extra step in your video. I always appreciate a great tutorial! I just tried to upload your plugin, Insert Headers and Footers, for my wordpress site which; a Twenty Ten theme and 3.8.1. But it said your plugin wouldn’t work on the site. Do you have a newer version of this plugin that would work on my site? I’ve been trying to get my sites verified by google for a few months now. Any help would be appreciated! Thanks for the tutorial. I just added my site, however I stupidly did the recommended method when I verified it so I didn’t get the code to add to the wordpress SEO plugin. Will this effect how effectively the SEO plugin works or doesn’t it matter as long as your site is set up/verified on google webmaster tools? Would really appreciate your help! No it will not affect the performance of the SEO plugin as long as your site is verified on Google webmaster tools. Thank you I have followed the tutorial but cannot really get it to work on my site can you please help. Thank you for this great tip. I have also added my site to google webmaster tools. Thank you so much! This is just what I was looking for!!! What about others Webmasters Tools like Bing, Yahoo, Pinterest and Alexa ? The process is same or any other method? For Bing, Yahoo, Alexa The process is pretty same, after signing-up for webmaster’s you’ll provided with a code to be pasted in your header.php and the get verified. I don’t think there is any such requirement for pinterest. Just make a pinterest account, link with your website and you are ready to go.